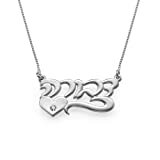 Silver Script Hebrew Name Necklace with Side Heart and Swarovski Crystal – Custom Made with Any Name! Amazon Price: $49.00 (as of October 18, 2017 8:13 am - Details). Product prices and availability are accurate as of the date/time indicated and are subject to change. Any price and availability information displayed on the Amazon site at the time of purchase will apply to the purchase of this product. Personalize this handmade solid Sterling Silver (0.925) Hebrew Print Name Necklace, which is decorated with a middle Heart, set with a Swarovski Birthstone in its center. This pendant is manufactured in double thick material and comes with a Sterling Silver Box chain. You may select any birthstone that you wish from the list below: Garnet, Amethyst, Aquamarine, Clear Crystal, Emerald, Pearl, Ruby, Peridot, Sapphire, Rose Quartz, Yellow Topaz, and Blue Topaz. One name or word per pendant. Feel free to write your name in English, and we will translate it into Hebrew for you. The chain length mentioned does not include the pendant. The size of the pendant varies in accordance with the name and style. The average pendant size is: 0.75 – 2 inch/ 2 – 5 cm.